Is Rudy Gobert the best center in the NBA? When the Golden State Warriors dynasty broke out several years ago, it seemed like the traditional center position was going to be phased out from the NBA entirely. The traditional center, someone who plays with their back to the basket, is slow, big, and clunky, was thought to have no place in modern basketball which is hyper-focused on speed, athleticism, and three-point shooting. This paved the way for a new type of center to emerge in basketball. A center who can space the floor, shoot from outside the paint, and can even distribute the ball on offense. Centers such as Nikola Jokic, Joel Embiid, and Brook Lopez are prime examples of how the new generation of centers are being both asked and taught to play basketball. While all of these guys are revolutionizing basketball for the center position on the offensive side of the ball, most of them leave something to be desired on the defensive side of the ball. In terms of defensive rating plus/minus, which determines a player’s average impact on his team’s defensive performance, per the points allowed over 100 offensive possessions, Lopez ranks 15th in the NBA, Embiid 30th, and Jokic 47th. This can lead to the argument of whether or not basketball teams really need their centers to be part of the focal points of their offense when traditionally, a center's most important job on the basketball court is to protect the rim. That is where I make my case that Rudy Gobert, a player who knows his game offensively while being asked to anchor the Utah Jazz defensively (one of the elite defensive teams in basketball), is the best center in professional basketball. When examining Rudy Gobert, the best place to start is his impact on the defensive side of basketball. Statistically, Gobert may not just be the best defensive center in basketball, but potentially the best defensive player in basketball. Going back to defensive rating plus/minus which I mentioned previously, Gobert leads the NBA with a plus/minus rating of 4.20. Gobert is one of only 4 players in basketball with a rating of 4 or over. The other three are Ed Davis, DeAndre Jordan, and Hassan Whiteside. In terms of rebounding, Gobert ranks 5th in the NBA and 4th among centers in terms of rebound percentage at 19.2%. The highest rebounding percentage rate of any player in pro basketball history is Dennis Rodman at 23.4% during the 1994-1995 NBA season. Gobert also ranks 8th in the NBA in defensive rebound percentage. Another stat that exemplifies how good of a player Gobert is Player Impact Estimate (PIE). PIE shows a player’s overall statistical contribution against the total statistics in the games that they play in. Essentially, it shows how much of a positive or negative impact a player has on a game. Gobert ranks 10th in the NBA with a PIE of 16.7. The biggest knock on Gobert’s game is his limitation on the offensive side of the ball. This season, Gobert is averaging a career-high 17.4 points per 36 minutes and also a career-high 14.5 rebounds per 36 minutes. However, despite those impressive numbers, Gobert has thus far taken 348 shot attempts with 345 of them coming from inside the paint. Gobert also is shooting just 64.2% from the free throw line this season, one percentage point higher than his career average of 63.2%. 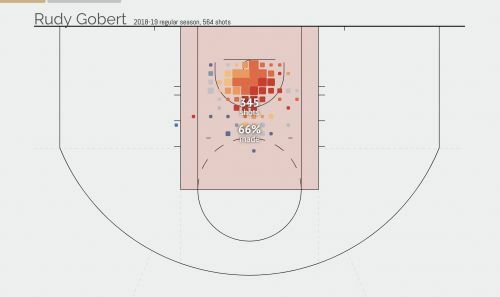 Rudy Gobert's shot chart during the 2018/2019 NBA season as of March 10th, 2019. However, that is not the way I look at it. While yes, Gobert is not going to be a threat to stretch out the floor (specifically the paint) offensively, Gobert already does so much for the 4th best defensive team in the NBA. 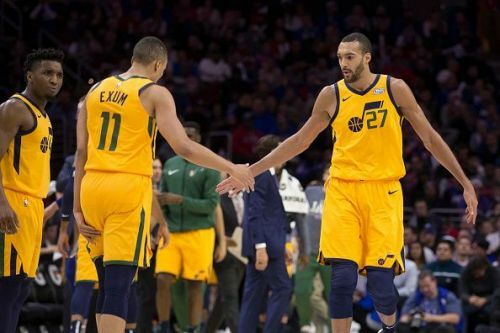 He is not only being asked to protect the rim (Gobert ranks second in the NBA behind Anthony Davis for block percentage among players averaging at least thirty minutes per game at 58.0%), but is also asked to guard the perimeter, so much so that even an average offensive contribution is more than satisfactory. Gobert still has a true shooting percentage of 67.0%; that ranks 5th among all players in basketball. When you make two-thirds of your shots even when the entire defense knows where are you going to be shooting from, why change anything? Rudy Gobert does not, and he has not throughout his now six seasons in the NBA. He sticks to what he knows offensively while absolutely dominating defensively. That is why I believe Rudy Gobert is the best center in professional basketball.